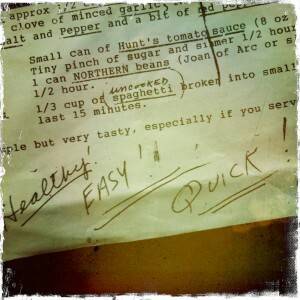 Posted byMT	 June 5, 2011 June 5, 2011 4 Comments on Healthy! Easy! Quick! Delicious! The secret is in the underscoring. Baby Dumpling’s dad emailed, to tell me he and Mrs. Dumpling had found part of a recipe Mom had given them. They were cleaning out the Dumpling’s stroller, and stuck in the side were half the instructions for Mom’s pasta fazul. “We would love to make it, but it cuts off on the right margin,” he wrote. The Dumpling is now two years old. His first summer, Mrs. Dumpling used to wheel the stroller to Mom’s every day on their walk. Mom’s last couple of months, she’d start the morning saying, “I’m too tired for the Dumpling today,” but by noon she’d be sitting out front, saying “Where’s Baby Dumpling?” as they came up the drive. She would never hold the Dumpling, because she didn’t want to give him her cancer germs, but she’d make faces and talk to him and celebrate every smile, every laugh she could get out of him. Hearing from them made me realize I haven’t called Mom’s sister Marie in weeks. When Mom died, I thought I’d be on the phone with her every day, just like Mom had been, just like I had been with Mom. I love talking to Auntie Marie. I love the way she looks at life, I love her cooking tips, I love her voice. But the prospect of calling is awkward. I feel like I don’t really have a reason to get in touch. Now that my parents are gone, I feel like I’m not really connected to their relatives. But once we’re talking, that all goes out the window. So I called Marie, and told her about the Baby Dumpling sighting, which made her laugh her magical laugh. She and my mom invented many names for people and things they loved, and Marie’s vision of Heaven can easily accommodate some form of Mom watching Mr. Smith Goes to Washington with her former neighbors. Marie said she follows basically the same recipe for pasta fazul, which she pronounces correctly as pasta fagioli. I can picture right where the Dumplings’ copy probably cuts off. Mom always made multiple copies of her recipes using her inkjet printer and creamy yellow paper she thought made things easier to read. 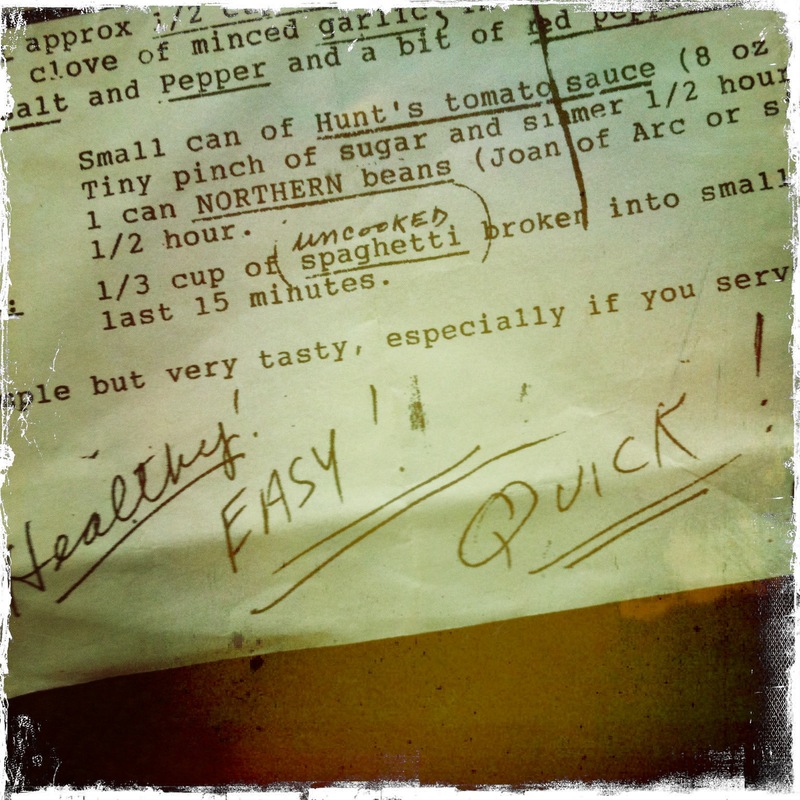 Usually she was copying recipes she had already typed up or printed and then annotated in pen. Here’s the completed recipe. Saute approx 1/2 cup celery (diced) with about 1/2 onion (diced) and a clove of minced garlic in olive oil. Add salt and pepper and a bit of red pepper flakes (optional). Add: Small can of Hunt’s tomato paste (8 oz size) AND 3 CANS OF WATER. Tiny pinch of sugar and simmer 1/2 hour. Add: 1 can NORTHERN beans (Joan of Arc or similar) and simmer another 1/2 hour. Add: 1/3 cup of uncooked spaghetti broken into small pieces and add during last 15 minutes. Simple but very tasty, especially if you serve with a little parm. Looks good. And probably another example of how food can be relatively simple and delicious at the same time. It also looks like easy and quick were preferred over healthy since they each had two underlines, and healthy only had one. Yeah, EASY! and QUICK! were definitely her preferences with regard to food preparation. And this is a great dish, though I always thought it strange that pasta and beans would go together so well.